Oh, my - what great taste you have!Pucker up for a positively perfect pout and select our personalized lip balms to hand out to your guests! We guarantee that these are favors they will go gaga over! This natural vanilla flavored, pocket sized lip balm can be added to pretty containers and sparkling gift bags as little tokens of your appreciation. They will be able to banish their parched lips while thinking of you when you add lovely personalized labels to these adorable little tubes.Create the lip balm favor that matches your theme, color and personality! Choose the labels that best match your celebration - you'll find romantic options, classic designs, as well as modern and edgy prints. Many of the labels' themes are available in a rainbow of colors, and customizable for up to three lines!For a more modern twist on this classic party favor, choose the chalkboard personalized lip balm - the scrolling design and the outline colors can be adjusted to match your preference. Or choose the trendy ikat design in several pastel colors and show that you are a contemporary queen of fashionable preferences with these fun little vanilla treats!Up the ante with fun colors and designs with different shades of "Candy Colorful" polka dots. Or turn any frown upside down with the help of the "Candy Stripe" labels, available in a rainbow of fun colors that are guaranteed to add a festive variety of fun to any gift bag, box or container!If romance or whimsy is more your game, choose from "Aqueous," "Garden Party," "Antique Chic" or "Geo Marble" designs.These amazingly affordable lip balms will surprise and delight your guests! Their practical usage makes them a sensible choice for your party favors, as well! 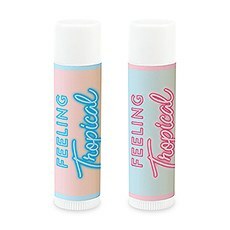 You can't go wrong with this fabulous little lip balms.The more you buy, the more you save! Make sure to check out our bulk pricing to get the best bang for your buck!